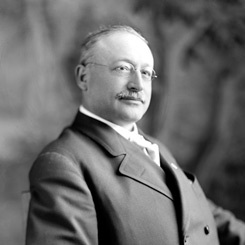 Image courtesy of Library of Congress A newspaper editor and labor leader, Representative Victor Berger of Wisconsin lead a brief yet storied career in the Congress. On this date, freshman Representative Victor Berger of Wisconsin introduced a resolution to amend the Constitution to dissolve the United States Senate. H.J. Res 79, read, “Whereas the Senate in particular has become an obstructive and useless body, a menace to the liberties of the people, and an obstacle to social growth. . . . All legislative powers shall be vested in the House of Representatives. Its enactments, subject to referendum . . . shall be the supreme law, and the President shall have no power to veto them, nor shall any court have the power to invalidate them.” The resolution would have transformed Congress into an all-powerful unicameral legislature. For decades reformers had agitated for changing the method for electing U.S. Senators–from elections by state legislatures to direct election by the people. It became a central cause of Progressives seeking to make government more democratic. Berger’s farcical proposal was meant to draw attention to that cause. “The Senate has run its course,” Berger asserted. “It must some day, as with the British House of Lords, yield to the popular demand for its reformation or abolition.” While many laughed at the resolution, the Milwaukee Congressman insisted that, “Our Constitution is really a hindrance to any reasonable growth in our public life, and it should be changed.” Referred to the House Judiciary Committee, H.J. Res. 79 received no action and died at the end of the Congress. Even had it passed the House, it would have had no prospect of consideration in the Senate. The Constitution requires both houses of Congress to approve all constitutional amendments before they are sent to the states for ratification. The first Socialist elected to Congress and one of the House’s most colorful Members, Berger focused on labor related issues during the remainder of his congressional career.